Hello blog, hello dear readers…I’m still on vacation. Yes, vacation is a lot of work. No, I’m not scared of work. I neither love nor hate work. It just takes up time, when I could be blogging. Plus, where has my inspiration gone? If you see it, can you tell it I’m in New Mexico, not in Marrakesh. It needs to hop on a plane and join me. (but that reminds me of a good quote: “Inspiration is the result of writing, not the cause”). And you know, when you have small children, and someone asks you “how do you DO it?”. I think about that, and it’s not so much what you DO, but what you ENDURE. Because really folks, it’s not that complicated to feed, clothe, play with, and enjoy 3 children. I do it every day, so do many of you. But here’s what’s hard for me. I’m a quiet person. To begin with, I have a soft voice, you can barely hear me when I talk. When telemarketers call, they ask if my parents are home. I say no, and hang up. I’m not exactly loud or boisterous by nature. But that doesn’t work with my kids. If I am just quiet, I almost disappear. Then the kids will be like “where did mama go?”. Then I’ll have to re-materialize. When you read child-rearing books, (it’s been a while since I’ve cracked one of those open), they always say “talk to your child as you go about your daily chores, narrate each activity that you do together”. I was always such a quiet mom, even to my first child. Everyone said that she wouldn’t talk early, etc. But she did talk early, or one time at any rate, and was lacking in neither quality nor quantity. Wait, I though I was reading a blog on Morocco, not some self-analytical mommy blog. Click. Hold your horses, I’m getting to the Morocco part. You see, the wonderful part about raising my kids in Morocco, is that Moroccans are nothing like me. Almost every Moroccan I meet has a similar relationship with kids. Moroccans generally celebrate children, whether their own, or others. They love to engage, laugh, tease, even provoke. My kids get kissed a lot, by other kids as well as adults. Adults are not afraid to interact with other people’s kids, since we don’t yet live in a fearful, or litigious society. Once we were at my work, and a man kissed my littlest boy, and he said to me “You see mama, the man LOVES me”. Susu sticks to our dear friend Si Mohamed, as a wedding procession goes by. When my daughter was younger, she didn’t yet get the Moroccan sense of humor. So when someone (a playful adult) would say to her “that’s not your baby brother, he’s mine, I’m going to take him home”, well my very literal daughter would burst into tears. I had to train her to recognize what we call “Moroccan joking”. Now she is a pro, and she teases and plays with the best of them. Once, when Amin was about 1 and a half, we went to one of the outdoor restaurant/playgrounds (Station Afriquia, for those of you who know). Amin didn’t want to eat with us and wandered through the tables. There was another family sitting a few tables away. Before I’d even noticed, the father picked up Amin, put him on his lap, and hand-fed him for the entire meal. They waved to us, we waved to them. I said “Allah y jazikom bi khair” (May Allah repay you with goodness). And that was that. Now, I’m sure that the other family didn’t think they were doing anything special. They didn’t have to overthink it. To them, a hungry kid is a hungry kid. In Morocco, when you are eating, even if it’s just a piece of bread, you offer some to anyone near you, whether you know them or not. My kids have learned to share, both in accepting what’s offered, and offering their own food. Many people recognize that raising the child is not just the parents’ responsibility. If you see a child, then you interact, not quite to the degree that you would with your own, but still. Some foreigners find this a little too invasive. I have learned to take advice, and even criticism, because I know that it’s not being dished out maliciously. Some specific examples come to mind. There are a few things that Moroccans seem to universally agree upon. One is that running is not a great idea. I’ve probably heard “Mat jreesh” (don’t run), about a million times, directed at my kids as well as every other Moroccan kid. This is because sidewalks are not great in Marrakesh, they’re about a foot wide, and change topography continually. It’s easy to fall, get hurt, or get hit by oncoming traffic. Right up there with not running, is not getting dirty. If you run, you might fall and get dirty. Moroccans like cleanliness. Moms are used to washing out clothes by hand, and so they try to get the kids to keep the clothes clean for a few days. Even now that washing machines are more common, there is always the economical question, of wasting water and electricity. The next thing is avoiding the sun. And the sun in Marrakesh is really hot, many people underestimate it, then bam, heatstroke. So people will always tell my kids to get into the shade. Or they will ask me to put a hat on the kid. My favorite time was when I took my 2 year old on a walk to the end of the street to the little store, in the middle of the day. A woman stopped me and said “please, don’t take this boy out at this time”. I said “we’re just going to the hanut“. And she said “Well, that’s not the hanut that’s closest to you, you need to go to Moh’s hanut“. I did not even recognize this woman as one of my neighbors (my bad), yet she knew where I lived and therefore which hanut was closest to my house. Now, I could have taken offense, but why would I do that? I’m getting a little too old to grumble at my elders. I must have said “wakha” (ok) and continued on. At least it’s interaction, you know? I appreciate it, because I know that it’s real. 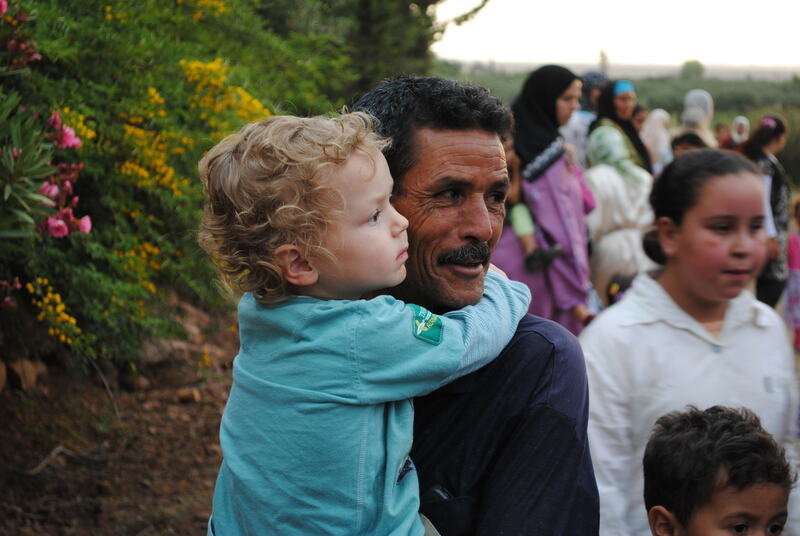 I think my kids have benefited immensely from all the interaction they’ve had with people in Morocco. I have a great friend, Raja, she’s been there for me and the kids ever since Karima was a baby. She’d knock on the door, just when I was slowly losing my mind, and she’d bring all this cheerful Moroccan energy into our home. She’d laugh with Karima, and celebrate her in ways I was maybe too close to do. She’d take pictures of her, talk to her, play with her, etc. And Raja was only 18 or so a the time. She would babysit so happily. (I was not anywhere near that helpful when I was the same age). I used to take Raja for granted. I had just come to expect that Moroccans are generally cheerful, hardworking, and helpful. Now I am too old to take anyone for granted. I am trying to learn how to be more like Raja. Now that my kids are a little older, I try to help out other moms with babies. I try to hold the baby, if she’ll have me, and I’ll tell the mom “go, do what you need to do, your baby’s fine”. Cause every mom needs that. How did this post get so long? When it rains, it pours. This article is indeed long but reading it is such a pleasure! I actually read it with the sound of your voice in my head … In France, we would say about you that you have “la force tranquille” !!! Thank you for showing the bright side of Morocco … not that I forgot why I moved here, but it’s nice to read so many good things about Morocco and Moroccans! Too often, I hear many people comparing it with western countries and I think that they are missing out so much! I hope you and the kids are well! ps: do you know this poem of Khalil Gibran called “Sur l’amitié”, I think you might like it! Well I appreciate you getting through the blog post. Thank you! La force tranquille, quel beau compliment, merci! I agree with you that when you spend a lot of time comparing Morocco to the West, you create a negative atmosphere and you waste a lot of time. It’s good to appreciate the treasures that Morocco has, all the while trying to share and help with any positive Western values one may have. We have much to learn from each other, but it’s a 2 way street. Love to you too, I’ll look up the poem. You are right, Moroccans adore children. On the bus , for example, if a mother has to look in her purse for the fare, she simply hands the baby to the nearest person to hold. they would go nuts for his fat cheeks. I think it is important for children to interact with LOTS of people. Thanks Elizabeth. 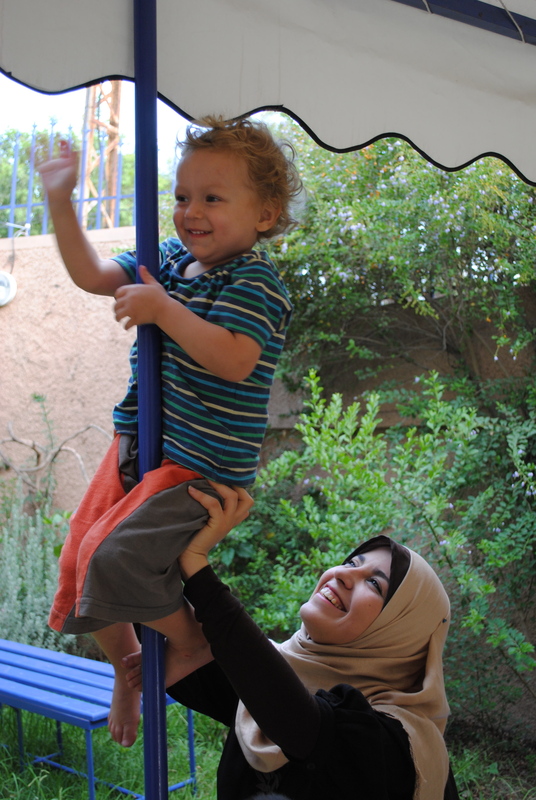 I do think that my kids are getting a lot of good from their interaction with lots of people in Morocco. I look forward to meeting Henry one day, insha Allah! We have been thinking about moving to Marrakesh (we live in California) and I am hoping to ask you a question. First of all, your blog is fantastic! It’s been pleasure reading it. We have been trying to figure out if there are any affordable English language schools. American School of Marrakesh looks great, but a bit too expensive to put two little kids there. I am hoping you have some suggestions and what schools to consider. Thank you and sorry for bothering you. Thank you! Now let me ask you some questions. How old are your kids? If they are young enough they can integrate into a good Moroccan french/arabic school. I agree the American school is expensive, and honestly does not live up to expectations. I have many friends who send kids there, and they are trying to get out. There is rumor of a British school opening up, I don’t know if that will happen this Sept. or the next. Next question, if you don’t mind, why are you thinking about moving to Marrakesh? I’m interested to know would bring you here. Don’t hesitate to ask more questions. Thanks so much for replying! We have an interesting story. My husband is originally from Marrakesh and I am from Tbilisi, but both of us have lived our entire adult lives in the US and have very confused identities 🙂 something that can’t be said about the kids who are 100% American. We have everything material one may need, but no time for our children. We are hoping for a less hectic life in Morocco so I can actually devote time to my kids instead of working insane hours. I also think kids will benefit greatly from having a large family around. We spent 3 weeks in Marrakesh this May and just loved it! My oldest boy is starting school this year (he is 5 years old) and the younger one will start next year (he is 4). They speak only English and our attempts to teach them our native languages have failed miserably. English is the only common language in our house that everybody understands. We are hoping to move over the next year or two, but the cost of tuition is a big deterrent. I have also heard mixed things about the American school. My sister in law used to teach there long time ago (when they were still in Gueliz). She now also lives in the U.S. Frankly, we are so torn, we can’t figure out how to make it happen. We have a place, so the rent isn’t an issue. We are reasonably certain we can put the food on the table, but the education is the last big question mark. Thanks so much for taking your time to help! This is such a wonderful atmosphere that you evoke. Spain is not that dissimilar – in fact it verges on the annoying when older women put on their bossy boots and tell you to put the kid into daycare! But I think that’s a relatively recent development. I was at a big hipermercado yesterday and a British Indian family were there, first generation parents, and Shamsie was tearing about the place having a whale of a time, bumping into people. (He knows he’s cute enough with the non-Spanish blond curls that he can get away with anything.) One of the Indian guys gave him some popcorn. In England you would practically have the man arrested for child molesting. But it pleased me so much that he regarded my son as just another little kid in the family, a huge extended family that didn’t stop where blood ties or even race or language did. Vive la difference I say! Medina, that’s awesome. I like your story about the Indian family, it provides respite from the western model of over-thinking every interaction. Beautiful post – heartfelt and real. Thank you – every mama feels what you shared. We need one another. I was away for a week w/ my mama on a cruise – a vacation of a lifetime, celebrating my mother’s recovery from cancer. My son, who I was missing (even though he’s now almost 15 yrs. old) suffered an accident – relatively minor, but requiring 6 stitches to repair a leg injury. A local mom drove by, saw him bleeding and drove him to the local clinic, sat with him while he received treatment, and then brought him home to my husband (the step-dad). For this, a small, but oh so appreciated kindness, I am so grateful. More of this – loving mothering of ALL our children. Laura, thanks for sharing this wonderful story. It’s nice to hear about people, wherever they live, choosing connection over separation. Nora, Nora, Nora, .. what shall i say, I really cannot gather the right words to express my feelings and I am reading your post. you won’t believe me if I tell you that you really made me cry. I was reading but at a moment I could not see the writing properly, it was like faded, or just like a fog was between me and the PC, but i quickly recognized that my eyes are full of tears, and I just shed the tears. your blog, which I just came across by chance, is seriously amazing. 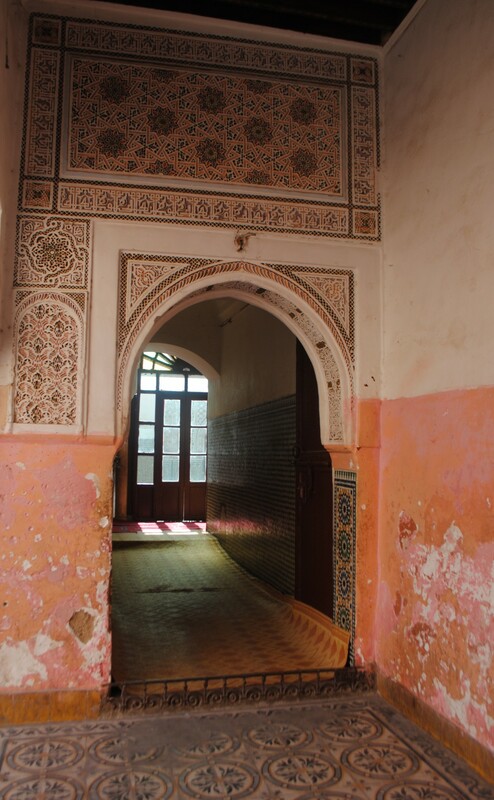 I wanted to tell you that I found your blog by looking for children’s books about Morocco. I read your story, and when I got towards the end was really intrigued by your telling of the kind woman Raja that helped you with your child. I thought it was really neat because I just so happen to know a Raja that has come from Morocco to where I live in America- she’s my Arabic professor, and all of us (the students in her class) instantly became bonded with her and love her. As I scrolled down, there it was..the picture of Raja! 🙂 From across the world your friend Raja is also my Arabic Professor Usedta Raja!! 🙂 Can you believe it? Mash’allah! I look forward to reading more of your blogs! Trip out! Y’all are lucky to have Raja as a teacher and friend. I love when connections like this happen, thanks Whitney, for sharing. Thanks for your post! I looked it up because I have a friend who is in Marrakech for a month with twin four year olds! , and scrounging to stay sane. I am sending her this post. Chukran!